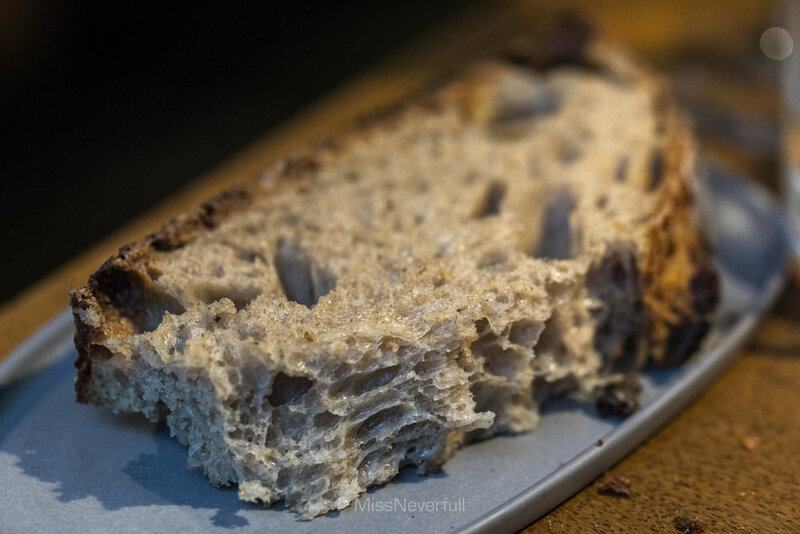 Few months ago when i firstly heard Noma is closing later this years to relocate, i booked my flight to Copenhagen without a second thought and luckily, i managed to get a reservation at Noma in early October. It was such an exciting trip that i finally got a chance to discovery the reputed Nordic cuisine. The first stop was the popular one-starred Relae, ranked No.40 on San Pellegrino’s World’s 50 Best Restaurants list 2016. The Italian-born head chef Christian Puglisi was raised in Copenhagen. 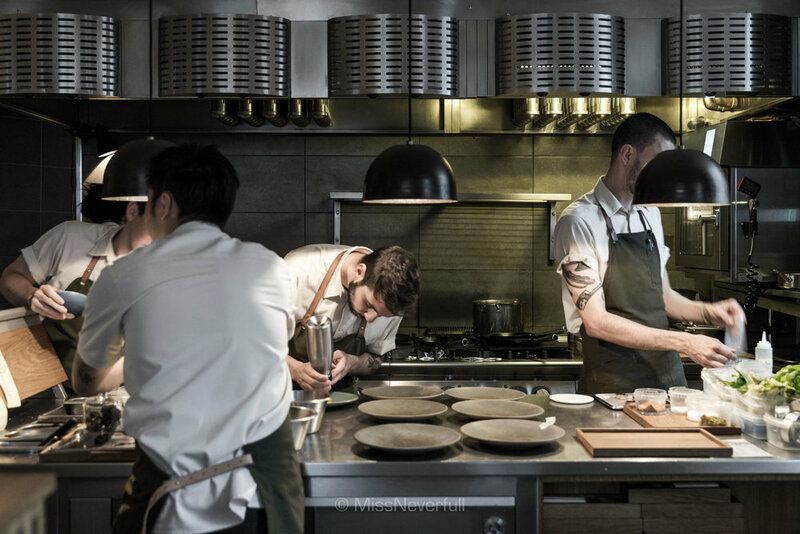 He gained experience at the michelin-starred Le Taillevent in Paris, El Bulli in Spain, and his culinary skills were lifted after spent 2.5 years in Noma as the sous chef. 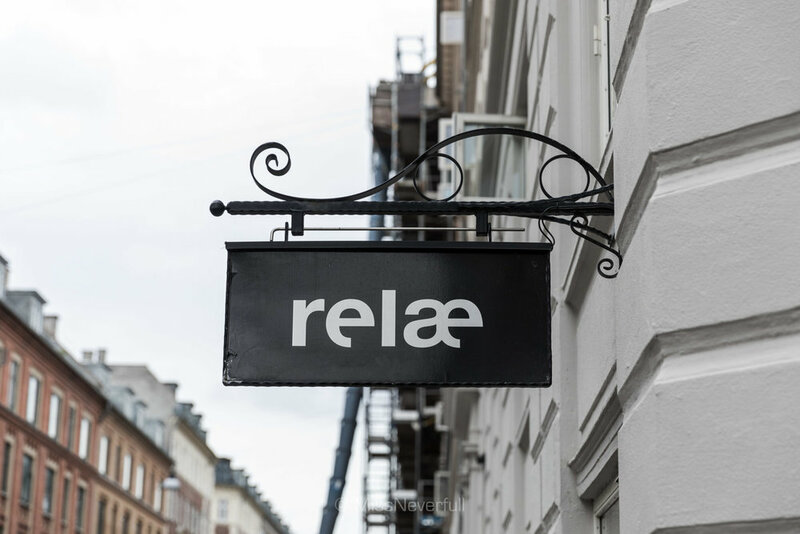 In 2010, Relae was opened in a quiet Nørrebro neighborhood of Copenhagen. Now in 2016 - six years after Relæ opened in Copenhagen, the Chef-owner Christian Puglisi is handing over control of his restaurant to the Canadian chef Jonathan Tam. On June 1st 2016 Relae kicked off the first menu of Head Chef Jonathan Tam.
" we works on focused and tasty food, no mass, no fuss. Everything is cut to the bone, no frames but the few hanging on the walls. Simplicity with quality comes first, great details are just beneath. It is our choice to be certified organic, because it is worth it. Wine? we pick 'em natural, your pour'em. " We were seated at the one of the two high tables by the main entrance which has a wonderful view of the open kitchen. It is always fun to see how the food is processed in front of my eyes! 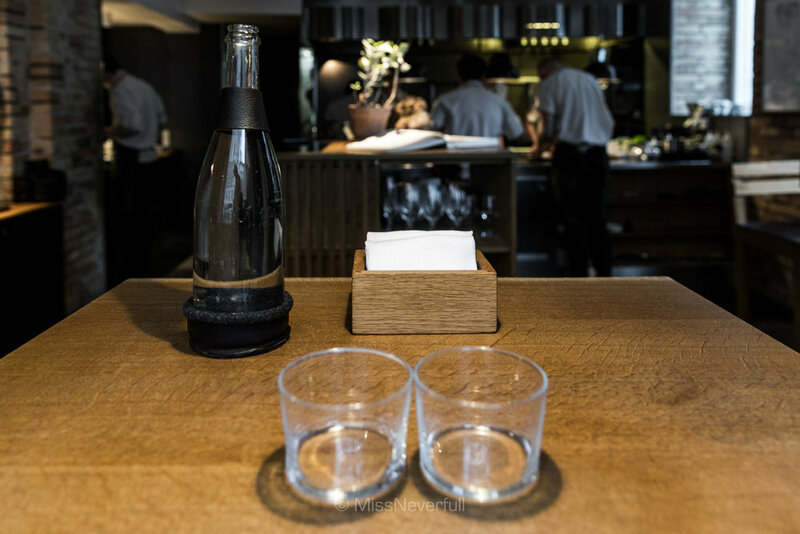 A full Relae experience includes a total of 7 dishes alongside some snacks costs 895 DKK exclude beverage pairing (685 DKK), I found it was really reasonably priced at the high-living-cost in Copenhagen, such as a bus and metro tickets are priced at 24DKK and a hotdog at 45DKK. If you are not very hungry, Relae do serves a shorter menu 'Relae menu' priced at 475 DKK with an option of beverage pairing (395 DKK). We both had the Relae experience menu (menu No. 475), my company had wine pairing while i had juice pairing . The menus were vegetable-driven with few fish or meat dishes as a main, all the ingredients are local and organic, sounds a wonderful deal for a lighter feast after 13-hour flight. We started with two snacks to awaken our palates. Crunchy pickled sorrel root with salted green strawberries from last year to bring a sour discovery from the land, and cod belly (imagine below) with an oceanic breeze. Next dish was raw cod with asier and coriander, with a drizzle of seaweed oil. With a clean and bland looking, this simple dish was sensitively paired with delicious tastes. A classical one, sliced apple and anise hyssop. It was a vegetable dish to be remembered. 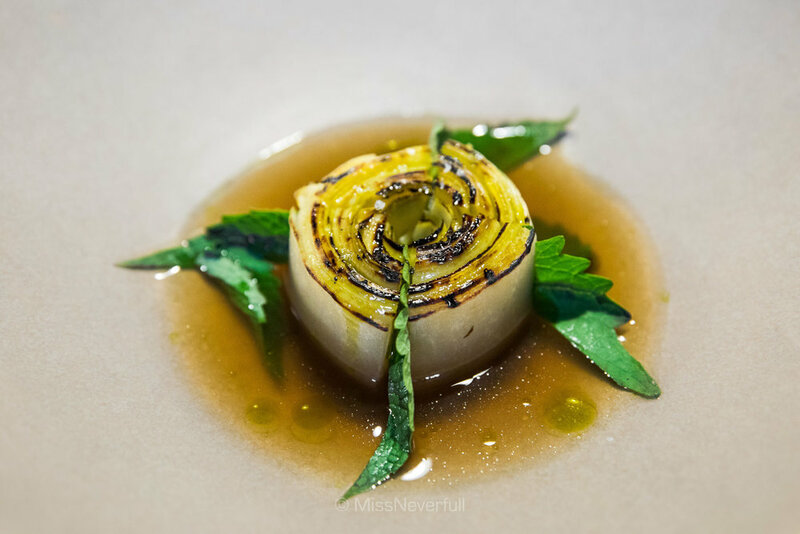 By using the local organic apple that was well-cooked and lightly grilled on the surface, it has a balance sweet and sour taste, the anise hyssop gives a veggie flavor to match. This dish proveS the saying of 'simple is the best'. Another highlight of the meal was the fine-cut cockles clams and enoki mushrooms prepared in a risotto way. This non-carb dish was so creamy and delicious with bursts of umami flavours of the cockles. 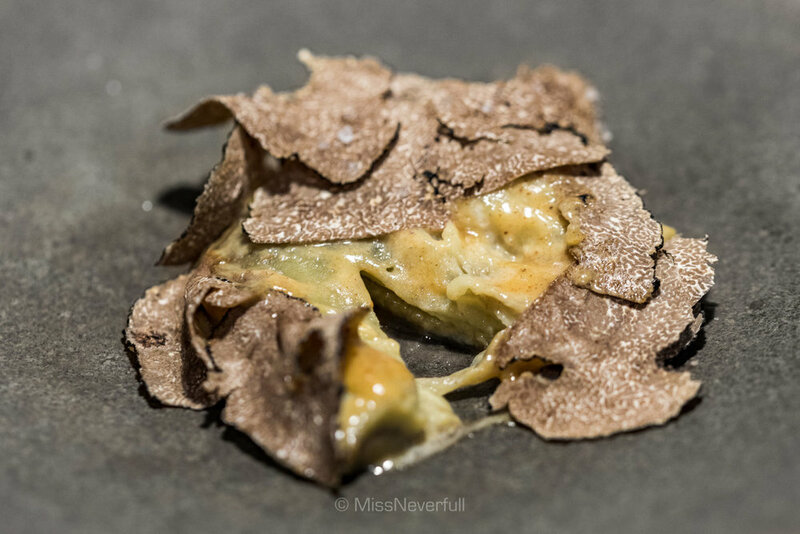 You'll never go wrong with truffle, especially fine-cooked ingredients like Relae's eggplant. Smooth and juicy eggplant which was mildly sweet, with some light cream to 'blend' the autumn truffle into the dish, marvellous. Two snacks before the main courses to arrived. Char-grilled beetroot skewer has a chewy texture and sweet taste, followed by a lamb tartare to cleanse our palate. Unfortunately, both of us don't understand the lamb tartare very well. For main course, my partner really enjoyed her Havervadgard lamb which was succulent and flavorful by itself. Surrounded by bitter greens prepared in different ways to bring different flavors and textures, the grassy tastes works well with the delicious lamb. Chef prepared grilled wild pike's cheek for me because I don't eat lamb. Crispy skin and delicious oils underneath, too with bitter leaves from Relae's own farm. Instead of the grass sauce pairing the lamb, butter sauce was used to marry the umami fish. Most Asians are not that into cheese platter especially stronger ones, so do I. But I don't mind to have younger cheese courses before having the desserts, such as burrata and mozzarella. Glad I really enjoyed the fresh mozzarella with raw mushrooms, which is a fixed routine at Relae. Fresh and moist cheese that absolutely satisfy my tummy. Followed by some spoonful caramelized whey with blackberry sauce to match. So creamy and well-balanced. My favorite dishes of the night includes the apple, risotto, truffle and of course, the ever-famous dessert of yogurt, marigold and lemon (oh! and the breads). It was a pretty creation of extra smooth lemon curd with yogurt and a layer of marigold powder. Every bite was so mouthful that was packed of harmony flavors. For beverage pairings, we both started with a glass of champagne (Resonance NV - Marie Courtin, Cote des Bars). I had juice pairing and my partner had wine pairing for the rest part of the meal, which were all organic drinks. The reason why it is called beverage pairing instead of juice or wine pairing because the wine pairing actually includes few glasses of juices, which is up to the availability of ingredients for cooking on the day. 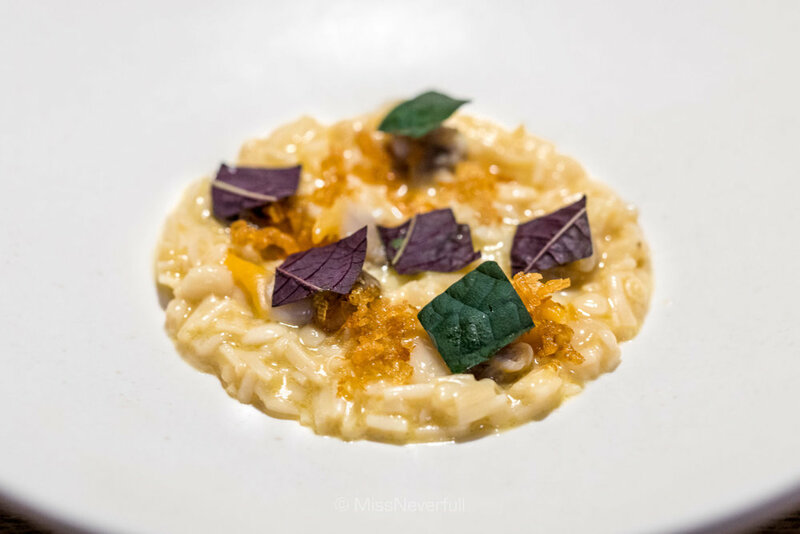 My first meal in Copenhagen featured some really good dishes and some average ones, it was truly creative, natural and overall, an enjoyable experience. 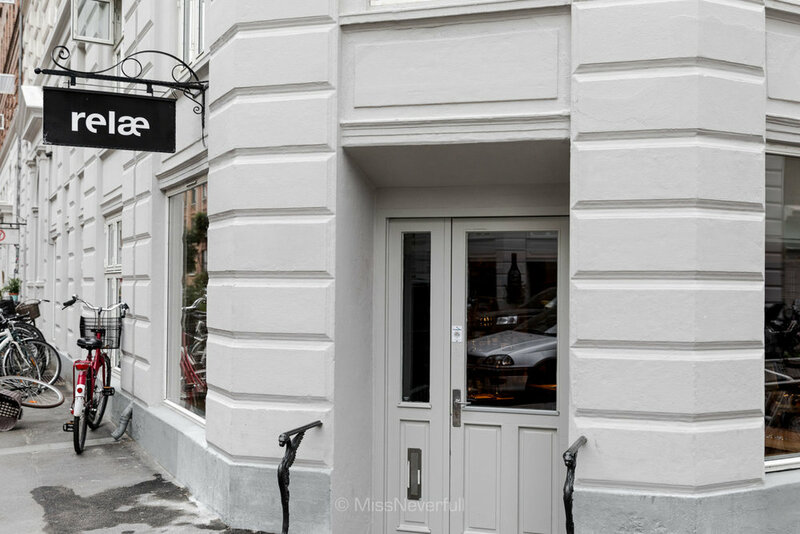 For its pocket-friendly price and high-quality food, i think it is a great alternative choice if you cannot get a reservation at top-notch Noma or Geranium (which was quite different style), but definitely not a replacement. If you are looking for a relaxed restaurant with top quality dishes, Relae is surely somewhere to go.